ABOVE: For a quick dip in the River Aare, catch the Marzili funicular from the Bundesgasse. Even in Bern, a capital that lies in the shadow of the Alps, the weather can turn hot in summer. So, when you've had your fill of sightseeing amid the sweaty crowds, do as the Bernese do: Grab your bathing suit and head for the Marzili swimming area on the River Aare. The facilities are so close to the heart of town that Swiss government workers often go swimming or picnicking during lunch hour. From the Parliament buildings, walk a block west to the upper station of the Marzilibahn funicular. Buy a ticket, get off at the lower station, and follow the crowd to the Freibad Marzili. There, you'll find a bathhouse where you can change before sunbathing on the grass or swimming in a river that begins in nearby Lake Thun (which is fed by mountain streams) and continues through the tiny Wohlensee on its way to Lake Biel/Bienne. 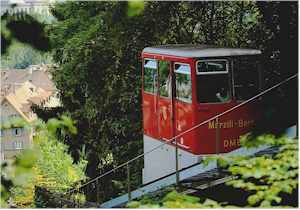 From 1885 to 1973, the Marzili Funicular was water-powered. The system was electrified in 1974, but one of the original cabins is preserved at the Swiss Transportation Museum in Lucerne. Marina Travel offers a variety of Aare River excursions in Zodiac inflatable boats, and several stop in Marzili. Check the river's water temperature, view photos of the neighborhood, look up bathing rules in the A-Z section, and more.